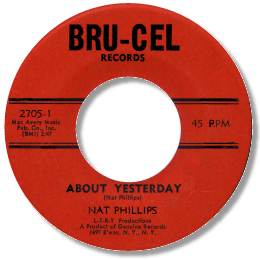 New Yorker Phillips only seems to have cut these 2 fine 45s, sadly, as his tightly controlled, tense but well modulated voice really hits the spot. “I’m Sorry I Hurt You” is rather well known thanks to it’s inclusion in a couple of reissue CDs, and in truth it’s a fine side, deep with a beat, with some good bluesy guitar flourishes. Flip it over, however, and you’ll find something even better. About Yesterday is a first division blues ballad, with the guitarist again just taking the honours from the sax player fronting the impressive horns. The dead slow beat is a killer and this is easily Phillips’ best performance, the strain and pain of the lyric clearly evident. 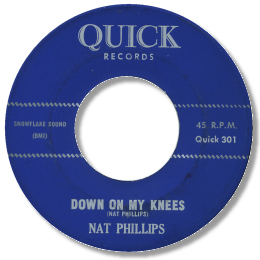 Down On My Knees is almost as good and judging by the sound could well have been cut at the same session. Phillips has a small vocal group behind him here and the gospel call and response they get going is simply marvellous. The featured tenor sax adds just the right touches as well. It may be that more records from this talent will appear – I for one certainly hope so.